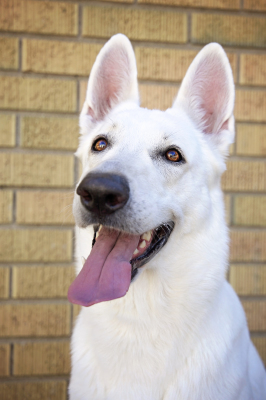 Daya is an FCI registered White Swiss Shepherd. She was born on March 31, 2012. 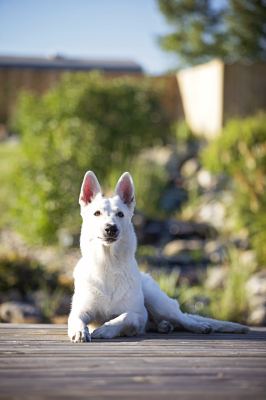 She was born and raised to 11 weeks in Bosnia by an incredible breeder there who has been exceptionally supportive in our goals and dreams for Daya and our kennel. You can see her beautful dogs by clicking on the pictures of each of Daya's parents. 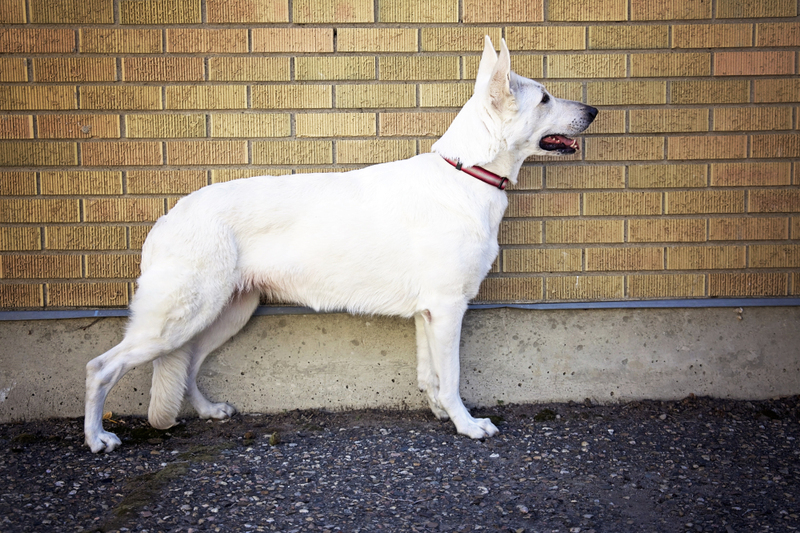 Her breeder did such a great job of raising, socializing and preparing Daya for the long flight that when she arrived at the airport in Calgary she stepped out of her crate full of confidence and joy. No fear at all. She had traveled from Bosnia to Germany by car and then flown many hours to us. At only 11 weeks of age. Her intelligence and enthusiasm is always evident. She learns quickly and only seeks to please her people and constantly be with us. 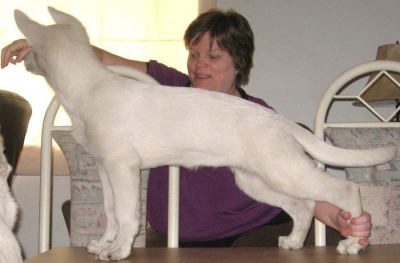 She is great with all ages of people, dogs, cats, even our budgies can land safely on her head with no fear. 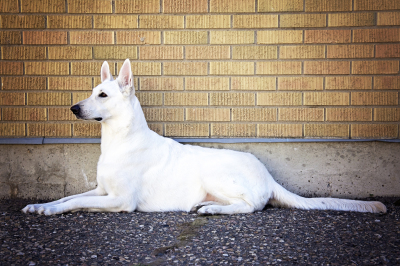 She does have a protective side, as all well bred Shepherds do for their homes and families. 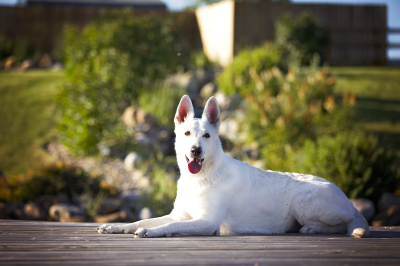 And has stopped an intruder once already to our home when she was only 18 months old. She used her voice and body to block him from entering any further into our home and stayed a few feet away from him till he backed out of the house and closed the door behind him. She made it clear he was going no further yet did not harm him, which shows a very strong character and intelligence. Yet she is also great with all manner of people. She adores children. This is Guadalupe. Daya's dam. 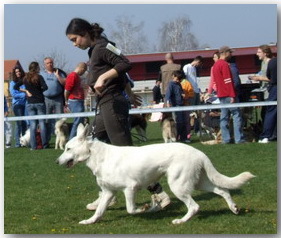 She is an FCI registered White Swiss Shepherd from the Beli Anđeo Kennels in Bosnia. She was whelped in 2007. If you click on the picture it will take you to her website/page where you can read all about her health screens, see pictures of her show career, view her pedigree and see plenty of pictures. This is Aron. Daya's Sire. 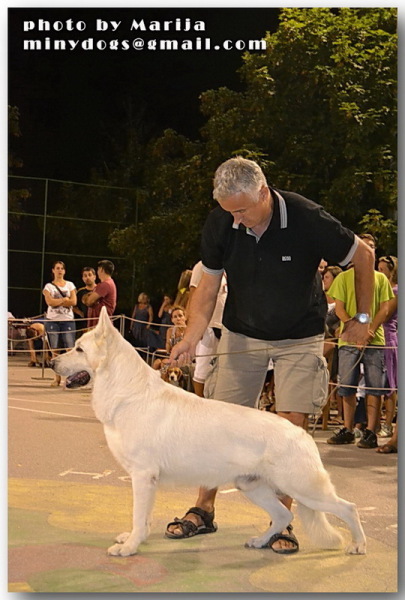 He is an FCI registered White Swiss Shepherd from the Beli Anđeo Kennels in Bosnia. He was whelped on September 1, 2004. If you click on the picture it will take you to his website/page where you can read about all his health screens, see pictures of his show career, view his pedgree, and see plenty of pictures.